Bilberry is native to Europe and is a member of the Heather Family (Ericaceae). Often confused with blueberries, this is a distinct different berry. It is also known as whortleberry, European blueberry and huckleberry depending on where you live. 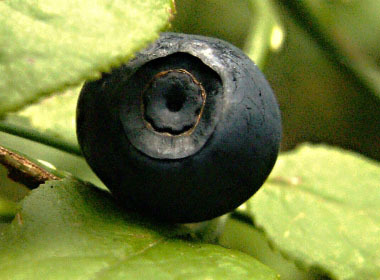 Wild bilberries have more nutrients than cultivated blueberries and are fabulous for eye health. 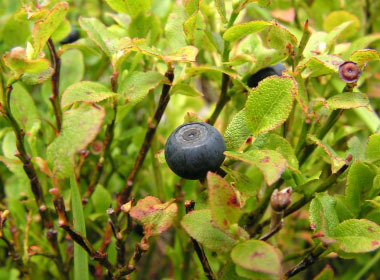 Although bilberries are wild shrubs, they can be cultivated. 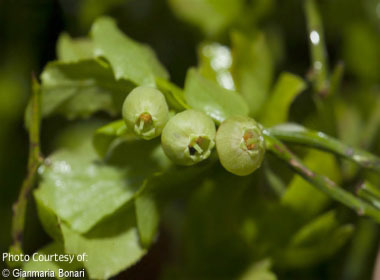 Bilberry cultivation works best in cool climates in USDA plant hardiness zones 3 through 8. 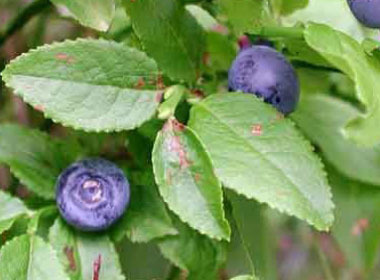 Distinguishing Features: Bilberries are a low-growing deciduous shrub that can be easily confused with blueberries. Most people can easily distinguish them from blueberries only when the berries are in season. Bilberries and blueberries may look similar on the outside; however, blueberry fruit pulp is light green in color, bilberry fruit pulp is red or purple. Flowers: The flowers are greenish yellowish–reddish, measure 4 to 6 mm (0.16–0.24”) long, are fused, shallowly 4 to 5-lobed. It produces 4 or 8 stamens, and a single carpel. The flowers are solitary in axils. They tend to bloom between May and July depending on latitude. The juicy fruit is spherical, 6 to 8 mm (0.24–0.32") broad, dark blue and glaucous, or black and shiny. The inside is dark red. 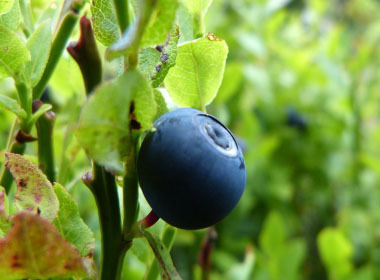 Fields of Nutrition has medicinal benefits and vitamin/mineral content of Bilberry. Leaves: The leaves grow alternate and short-stalked. The leaf blade is elliptic–ovate, tapered, finely serrated, and bright green. Height: This shrub grows anywhere from 10 to 40 cm (4 to 15”) tall. The stem is erect, abundantly branched, and woody. Older stems are round and brown; the younger stems are more bristly, and green. Habitat: The bilberry shrub tends to prefer young and grove-like forest heaths and swamps, yet they can occur in drier areas also. They also are found in acidic, nutrient-poor soils throughout the temperate, arctic, and subarctic regions of the world. 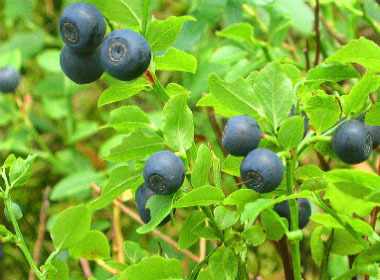 Bilberries are one of the most common coniferous forest dwarf shrubs. Bilberries do not like heat. Edible parts: Berries are the edible parts of this shrub. They can be used in jams, pies, ice cream, or anything else in which berries are enjoyed. The fruit can be consumed raw or cooked; a slightly acid flavour is detected if eaten raw. The fruit can be dried. A tea can be made from the leaves and the berries.